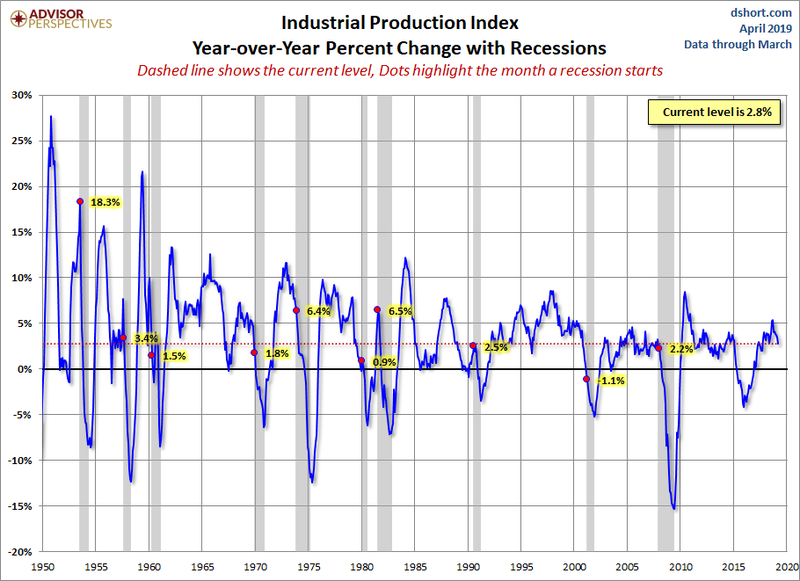 Tuesday's report on Industrial Production for March shows a 0.1% decrease month over month. This was worse than the Investing.com consensus of 0.2%. The year-over-year change is 2.77%, down from last month's YoY increase. Four big indicators that the NBER Business Cycle Dating Committee is understood to weigh heavily in its cycle identification process. Official recession calls are the responsibility of the NBER Business Cycle Dating Committee, which is understandably vague about the specific indicators on which it bases its decisions. This committee statement is about as close as it gets to identifying its method. Tuesday's report on Industrial Production for March shows a 0.1% decrease month over month, which was worse than the Investing.com consensus of 0.2%. The year-over-year change is 2.77%, down from last month's YoY increase. 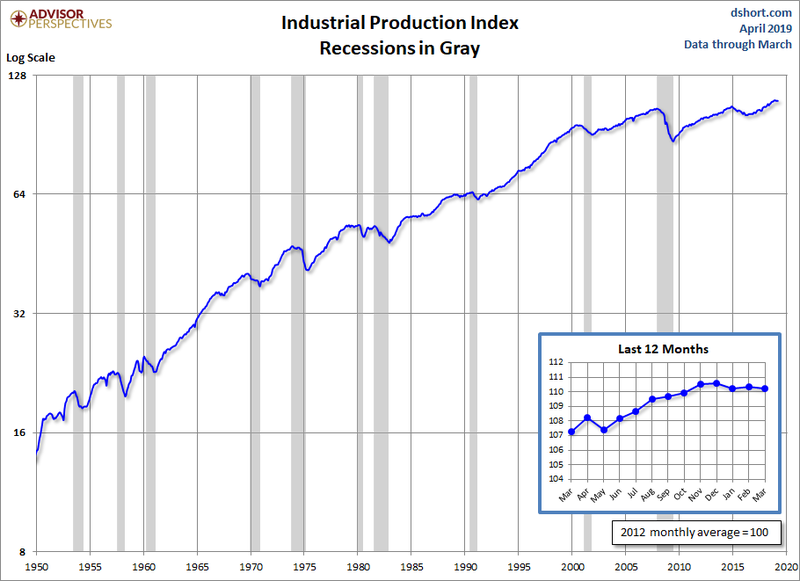 The chart below shows the year-over-year percent change in Industrial Production since the series inception in 1919. 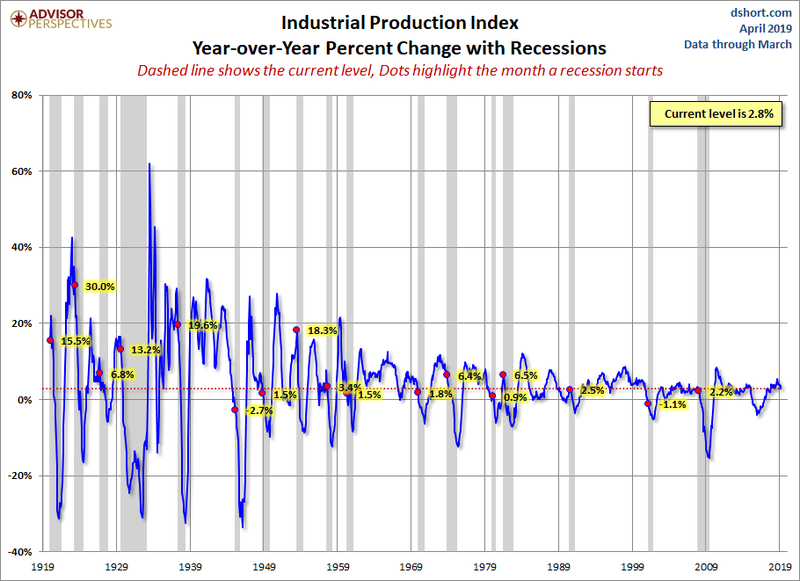 The current level is lower than that at the onset of 8 of the 17 recessions over this time frame of nearly a century. 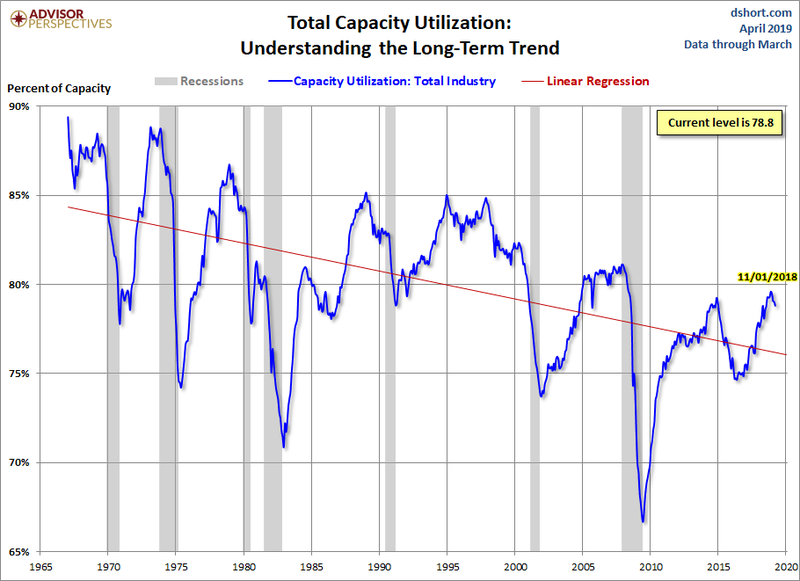 Here is a chart of the complete Capacity Utilization series, which the Fed began tracking in 1967. The linear regression assists our understanding of the long-term trend. We've highlighted the post-recession peak in November 2018. The latest reading is just below its interim peak and climbed above the regression in mid-2017. 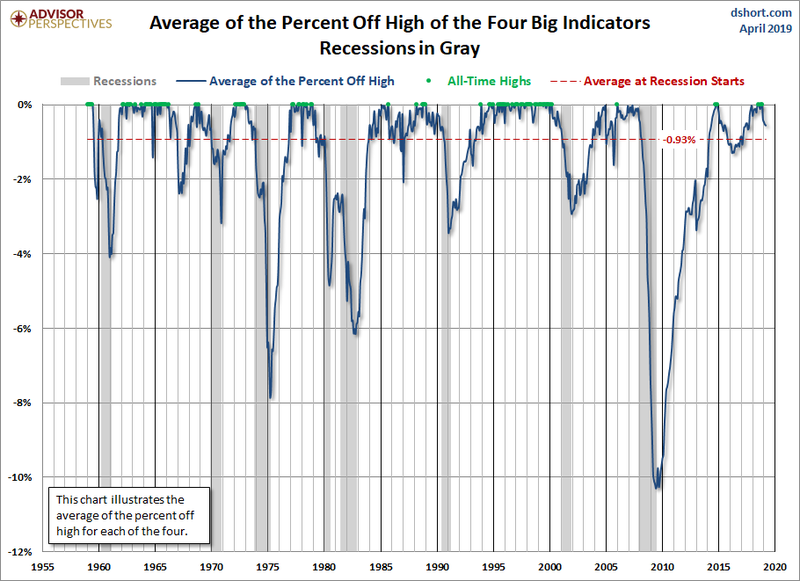 Here is a percent-off-high chart based on an average of the Big Four. 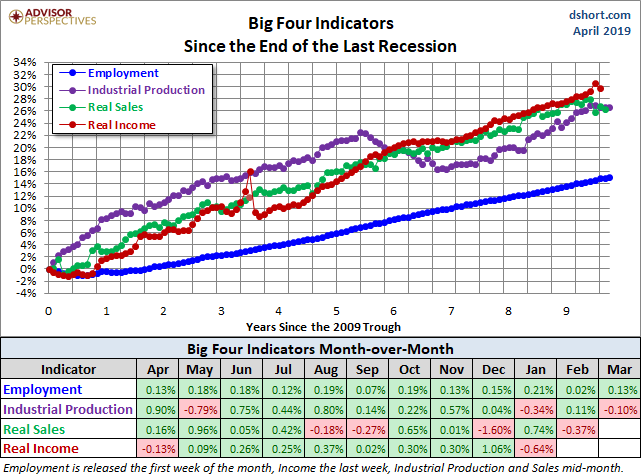 The average of the four set a new all-time high in November. The percent-off chart in this article shows all zeroes, but we have only extrapolated the figures that have yet to be released for the month and will find out whether we've hit another all-time high once the data is fully released for the month. The next update of the Big Four will be the latest numbers for Real Retail Sales, which will be released after Retail Sales comes out this Thursday. 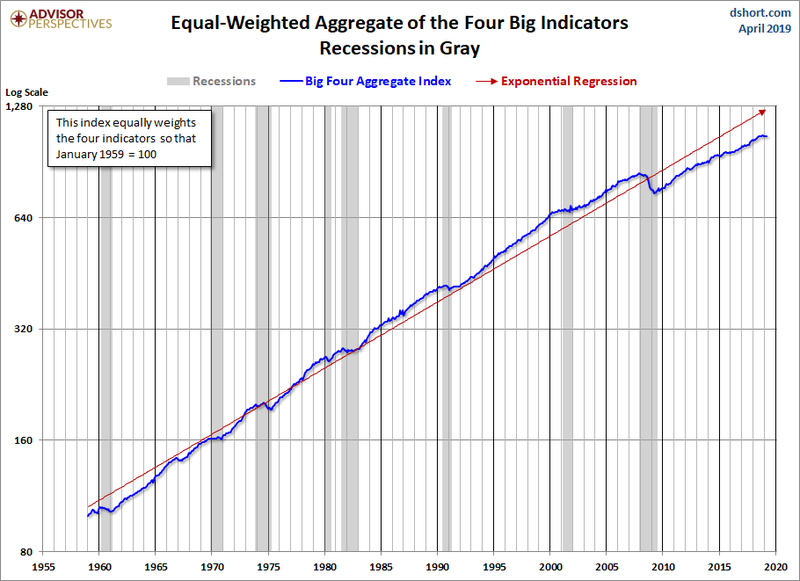 The charts above don't show us the individual behavior of the Big Four leading up to the 2007 recession. To achieve that goal, we've plotted the same data using a "percent-off-high" technique. In other words, we show successive new highs as zero and the cumulative percent declines of months that aren't new highs. The advantage of this approach is that it helps us visualize declines more clearly and to compare the depth of declines for each indicator and across time (e.g., the short 2001 recession versus the Great Recession). Here is our four-pack showing the indicators with this technique. 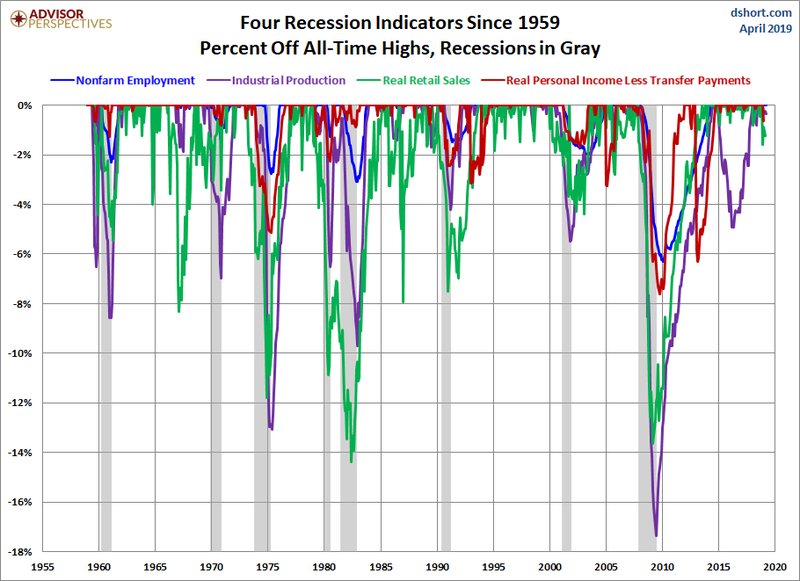 The chart above is an excellent starting point for evaluating the relevance of the four indicators in the context of two very different recessions. In both cases, the bounce in Industrial Production matches the NBER trough, while Employment and Personal Incomes lagged in their respective reversals. Now let's look at the 1972-1985 period, which included three recessions: the savage 16-month Oil Embargo recession of 1973-1975 and the double dip of 1980 and 1981-1982 (6-months and 16-months, respectively). The charts above focus on the Big Four individually, either separately or overlaid. Now let's take a quick look at an aggregate of the four. The next chart is an index created by equally weighting the four and indexing them to 100 for the January 1959 start date. We've used a log scale to give an accurate indication of growth, and also added an exponential regression to assist us in seeing the secular patterns of faster and slower growth. 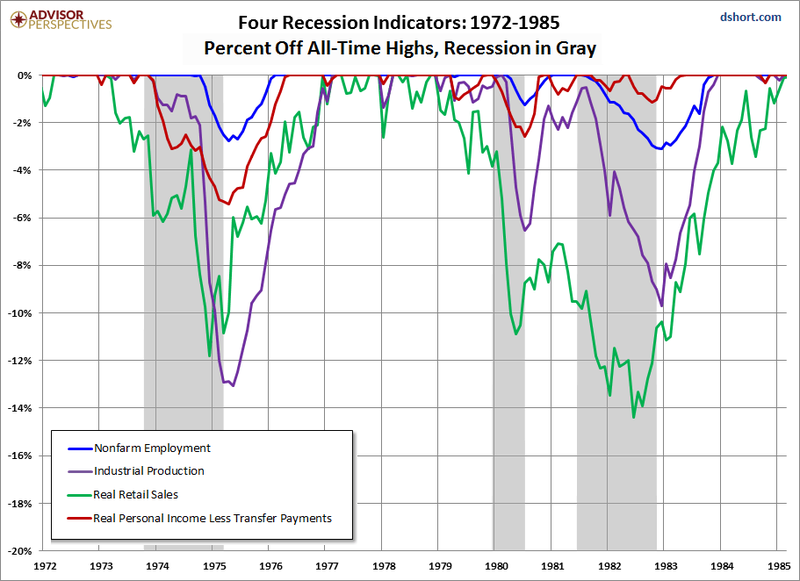 As we can readily see, growth of this aggregate indicator has slowed dramatically since the end of the last recession. 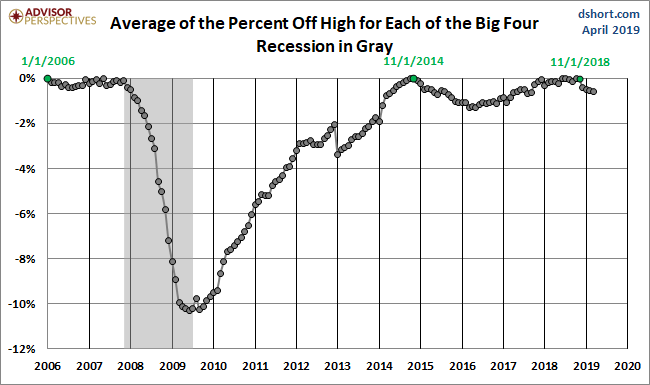 Now let's plot the percent off high for this aggregate index. 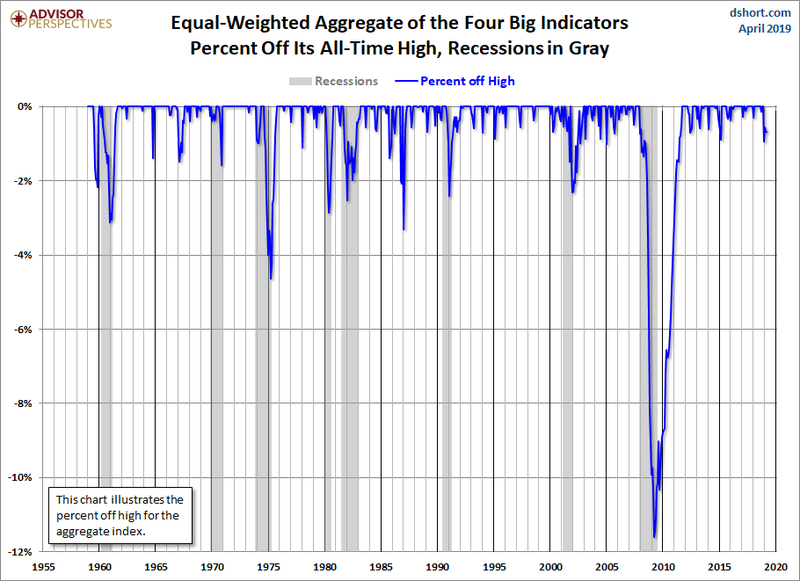 As we immediately recognize, it is completely worthless as a leading indicator of recessions. The aggregate index set a new high the month before the recession began for five of the eight recessions since the early 1960s. We can construct a better leading indicator by plotting the average of the percent off highs for each of the four, which is the technique we've used in the next chart. Here, we've highlighted the months when all four indicators were at all-time highs. 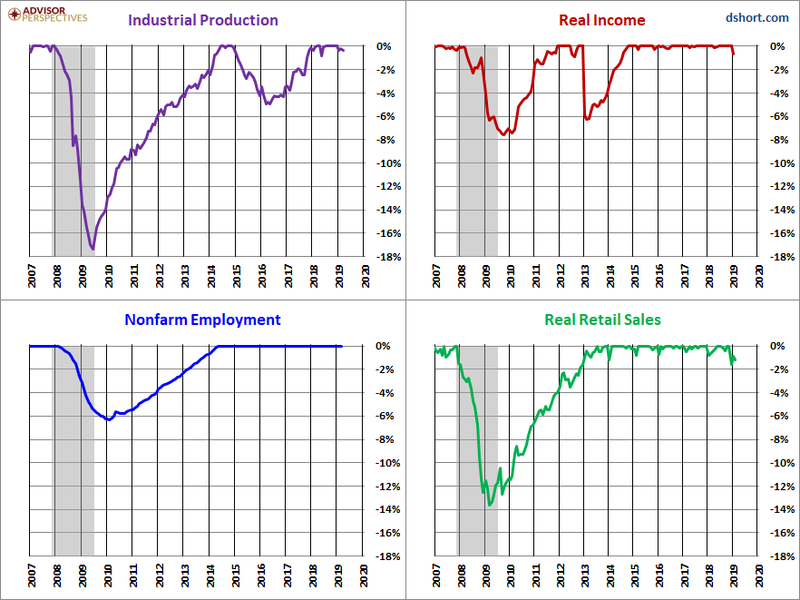 The dashed line shows the -0.93% average of the four at recession starts. 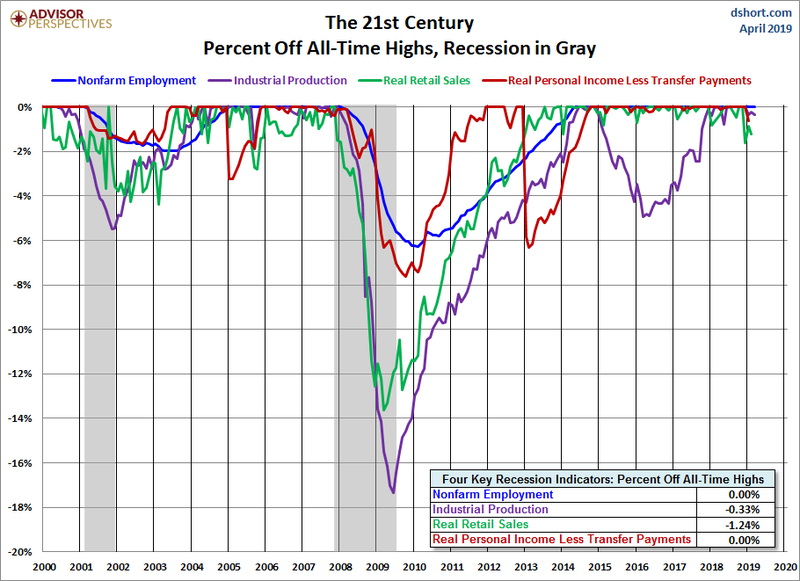 The chart clearly illustrates the savagery of the last recession. It was much deeper than the closest contender in this time frame, the 1973-1975 Oil Embargo recession. A log scale plotting of the complete data series to ensure that distances on the vertical axis reflect true relative growth. This adjustment is particularly important for data series that have changed significantly over time. A percent-off-high manipulation, which is particularly useful for better understanding of trend behavior and secular volatility. 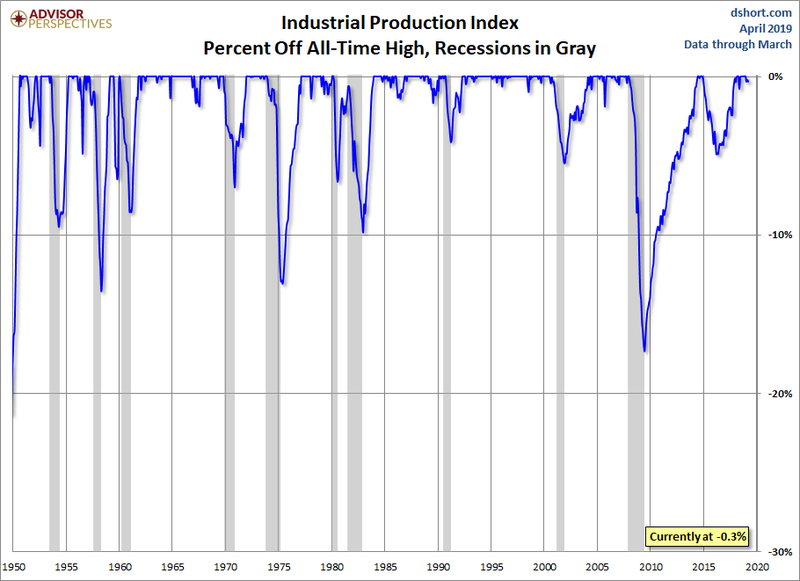 The US Industrial Production Index (INDPRO) is the oldest of the four indicators, stretching back to 1919, although we've dropped the earlier decades and started in 1950. A Note on Recessions: Recessions are represented as the peak month through the month preceding the trough to highlight the recessions in the charts above. For example, the NBER dates the last cycle peak as December 2007, the trough as June 2009, and the duration as 18 months. The "Peak through the Period preceding the Trough" series is the one FRED uses in its monthly charts, as explained in the FRED FAQs illustrated in this Industrial Production chart.